Running is one of the most egalitarian sports there is. Anyone with a pair of shoes can get outside and go for a run, making it a very accessible form of physical activity. Despite this, beginning runners often make mistakes that lead to costly and painful injuries. Follow these tips as you begin your running career to avoid injury and get fit. 1. Invest in high quality running shoes. Getting the appropriate running shoes for you is the best way to prevent an injury when running. Start by visiting a running store, where staff members are trained to help you find shoes that fit. Ask if the store performs gait analysis, which can help you find the best shoe for your foot type. A good pair of running shoes might cost $80 to $100, but it is better than a $30 shoe that causes you to develop an injury. If you’re just starting out, keep your expectations reasonable. A good way to start is one block at a time. Jog a block, walk a block and repeat for up to a mile. This will build your endurance without overtaxing your body. 3. Pay attention to your gait. For proper form, maintain a quick and short stride. Keep the head high and hands relaxed. Focus on pushing up and off the ground with each step. 4. Make a training plan. Even if you aren’t training for anything in particular, it is smart to develop a running plan. A good plan will start slow and increase your endurance over the course of several months. Being flexible in your plan is important to prevent injury. 5. Be attentive to pain or discomfort. Muscle fatigue or soreness after a run is normal but pay attention to sharp or throbbing pains that do not go away. If your pain persists, visit our sports medicine experts to get an accurate diagnosis and effective treatment plan. Joining a running group is a great way to stay motivated and learn more about running. Alternatively, ask a friend to join you on your runs. Making running a social activity is a great way to stay motivated. 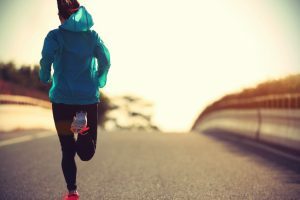 Running can be a safe and effective form of exercise, but it is also a common cause of overuse injury. If you notice an ache or pain that just doesn’t go away, contact our orthopedic specialists immediately. Ignoring a running injury can cause it to get worse over time, leading to more serious problems in the future.